Father Moran: You lot figure out which book is the best yet? Bobby Sands: We only smoke the Lamentations, right miserable cigarettes. 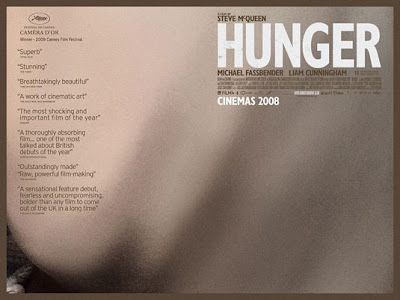 HUNGER is by far one of the most complex experiences I’ve had at the movies in some time. It is immediately intriguing. Very little is said but so much is shown to contextualize exactly what it felt like in 1981 in Northern Ireland. A man we do not know looks at himself in the mirror and is clearly questioning something about himself, as he soaks his bloodied knuckles in the sink. This same man checks beneath his car for potential bombs before he gets in it. He is so clearly burdened by the heaviness of his time and the decisions he has made to fit into that time that watching him while not knowing exactly who he is or what he does or where he’s going, instantly creates the need to know more. The reveal itself is slow enough to allow for a single snowflake to fall on a knuckle and fully melt before us, but once writer/director, Steve McQueen, does show us what is really going on, you will recoil in horror without being able to turn away. 2,187 people were killed between the years of 1969 and 1981 when Parliament decided to remove special category status from prisoners who committed violent crimes in the name of politics. Therefore, members of the Irish Republican Army who had staged protests that got violent or blown things up in the name of their cause were now to be subjected to the same prison conditions as common murderers and thieves. This was the presumption anyway. Instead, they were placed two by two in tiny chambers that were infested with maggots, had human excrement all over the walls and contained, for lack of a cleaner description, no pot to piss in. So not only were they not being given any consideration for their convictions but they were being treated as though they were sub-human. It is certainly hard on the system to look at but it is all shot so delicately and so intensely that you are drawn in so closely that it breaks your heart. HUNGER follows brief party leader, Bobby Sands (Michael Fassbender) through his time as a prisoner at the HM Prison Maze until he embarks on a now infamous hunger strike. This is McQueen’s first screenplay and first film and yet he executes this fragile material with such grace and technical prowess that one would think he’d been doing this for years. This tightly told story is told with little to no dialogue but yet never gets tedious. The truth is that the harshness of these prisoners’ supposed living arrangements is so dire that all McQueen needs to do is place his camera in the right spot and let it all just happen naturally. Thanks to cinematographer, Scott Bobbitt, McQueen’s camera is always in the right spot. The imagery is as colorful and lustrous as it is jarring. The silence allows for the our own thoughts to become more fiery without the distraction and focuses out attention on what the characters could possibly have been thinking. Just when you think you’ve seen enough misery, it suddenly gets that much worse. I do not want to dissuade anyone from seeing HUNGER as its power and beauty are far more satisfying and enlightening than its ghastly truths. That said, the hunger strike itself does not happen until the third act and when it does, you will lose any hunger you yourself may have had prior. What you will have lost in appetite though, you will have gained in compassion. How many sheep would you give Hunger? Wow. I have the screener of this at home waiting to be watched. I now really can’t wait to watch it since it’s Black Sheep Rev.’s first A-grade of 09! Thanks, Chazz. I am certain you will like this film. It is very raw.